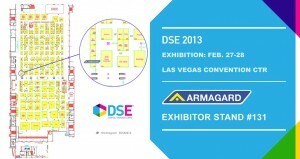 Last updated on February 26, 2013 March 26, 2013 by Mike Thomas for Armagard Ltd.
It’s over for another year, but the ‘Integrated Systems Europe’ show proved yet again to be a great exhibition for the Armagard team. Situated in Hall 10 of the digital signage area, our team was busy throughout the show answering a number of questions and meeting a number of people who are sure to become great contacts for the years ahead. Not just a great show for Armagard; ISE-2013 set new records in overall attendance, with a recorded 8% increase in registered attendees at 44,151; and for the first time ever, the growing show occupied all 12 halls of the Amsterdam RAI. The Armagard team was in good spirits this year, the weather was clear, setup had gone well, and the team were ready for the show on Tuesday morning. Furthermore for 2013 our exhibition group had increased from three to five to include our French and German account managers (below), which allowed visitors from these territories to speak easily in their own language. The aim was to improve our response rate to attendees, and achieve a greater 1-to-1 discussion rate with visitors. Even with our increased team size and extra language skills, we were delighted to find ourselves consistently busy over the three day show. We spoke to a diverse range of visitors from over 16 different territories; all who had different requirements and environments questions, giving our team the perfect opportunity to flex their product expertise and outdoor LCD enclosure knowledge to meet enquiry demands. Each enclosure on display was unique in its design and function, and allowed our team to demonstrate the variety of applications and markets suitable for an outdoor enclosure. However, the newest designs proved the most popular. In particular, our white outdoor totem with air-conditioning received a notable amount of attention, as many of our stand visitor’s came from environments that experience extreme heat. An air-conditioning unit will take an enclosures operating temperature up to 40°C, making them great for direct sunlight areas and are available across our full range on enclosures. In addition, the 52” touch-screen enclosure and the 42” PCB controller board also enjoyed enhanced attention, with many finding the controller extremely useful for having a pre-set system to control temperature, and this eliminating fuss. Overall, bringing these enclosures to an exhibition not only allowed us to showcase the latest developments at Armagard that meet market requirements, but just as importantly allowed our visitors to formulate an accurate impression of the quality and security they will be buying. 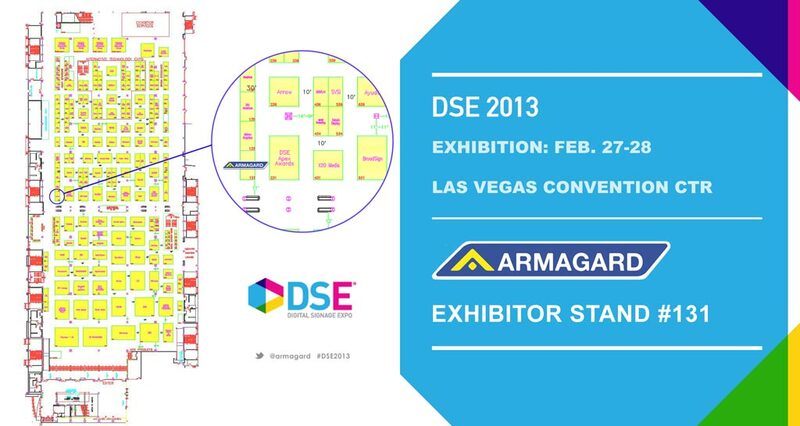 Armagard will be attending this month’s Digital Signage Expo (DSE) exhibition in Las Vegas between the 27th – 28th of February, so if you’re visiting the show make sure to drop by and see the enclosures for yourself. We’re already booked in for ISE’s 2014 digital signage area, but take note, as this area next year will be relocated from halls 10, 9 and 8, to hall 8 only. In addition, show organizers will be opening a new entrance to the RAI from hall 8, which is located significantly closer to the train station and will provide a new route of traffic for incoming visitors. We look forward to seeing you on our stand in 2014. This entry is filed under expos, Shows/events. You can follow any responses to this entry through the RSS 2.0 feed. Both comments and pings are currently closed.